This is the first time that I've come across this product and apparently, it's already on it's second generation. The Zipit Wireless Messenger 2 or Z2 for short, is an instant messaging device that allows you to access instant messengers through the device's WiFi, kinda like Sony's Mylo. 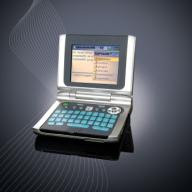 The Zipit Wireless Messenger 2 (Z2) can support all major IM platforms such as YM, AOL, and MSN and best of all, you don't have to pay any monthly or per message fees. Aside from communicating with your friends, the Zipit Wireless Messenger 2 (Z2) also has an integrated music player so you can listen to your MP3s stored on a miniSD card and also allows you to view your photos.